Religion's status socially is under pressure – the questioning of new Liberal Democrat leader Tim Farron over his beliefs suggested an anxiety about Christian evangelism driving a political agenda, while atheism has been taken up as a badge of intellectual superiority by fans of Richard Dawkins. But theatre has a soft spot for the ideas and language of spiritual endeavour. While there are plenty of science-orientated productions at the Fringe (Tangram, for example, are completing their 'Scientrilogy' with a musical look at the life of Marie Curie), these tend towards explaining concepts, whereas religious iconography offers a way of exploring deeper issues. Another artist who finds inspiration in Christian thought is Jo Clifford. Although The Gospel According to Jesus, Queen of Heaven could be mistaken as controversial – imagining Jesus as a woman – Clifford insists she is 'completely in sympathy with most of the values of early Christianity and profoundly moved and inspired by the Jesus we read about in the Gospels.' Addressing the antipathy directed at LGBTQI people, and its roots in religious belief, Clifford's piece is making a statement for a more inclusive faith, as well as drawing a smart parallel between the New Testament's 'Man of Sorrows' portrayal of Christ and modern persecuted minorities. And it is upon the foundation of Christ's words that Clifford built her script. Meanwhile, in Charlie and the Philosorappers, Charlie Dupré sets up the creator of the universe in a square-go with a certain anti-theist biologist. 'During his rap battle with [Richard] Dawkins, he covers three of the main arguments for his existence, and the audience are given the vote at the end,' Dupré explains. With the show's emphasis on Scottish thinker David Hume – and featuring an appearance from the mighty German intellectual Nietszche – Dupré's God is more of an intellectual assumption than physical entity or principle worthy of worship. In The Temptation of St Anthony, Tom Bailey was inspired by stories of a fourth-century saint, and set out to examine the relevance of his battles with demons in a contemporary society. 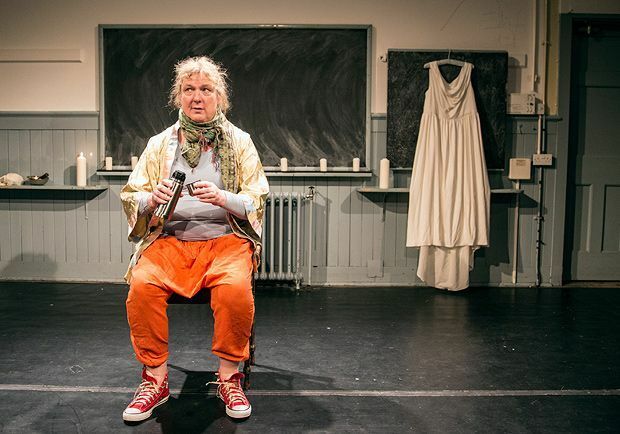 In a production supported by the Wellcome Trust, Bailey exposes the thin line between what is now understood as a challenging mental health condition but what was once understood in more mystical terms. The diversity of religious imagery and traditions on display at the Fringe are a reminder of how these ancient systems are symbolic ways of examining common human experience, and the theatricality of theology can lend an intensity to what might otherwise be a dull discussion of Big Ideas. Religion may be controversial, but it suggests a smooth strategy for summoning powerful performances. Jesus is reinvented as a transgender woman in this work written and performed by Jo Clifford. Spoken word performance by David Lee Morgan over music tracks by CloudFistConceptz. William Blake gets the hip hop treatment as rapper / beatboxer Testament and scratch DJ Woody tackle his most famous poems.